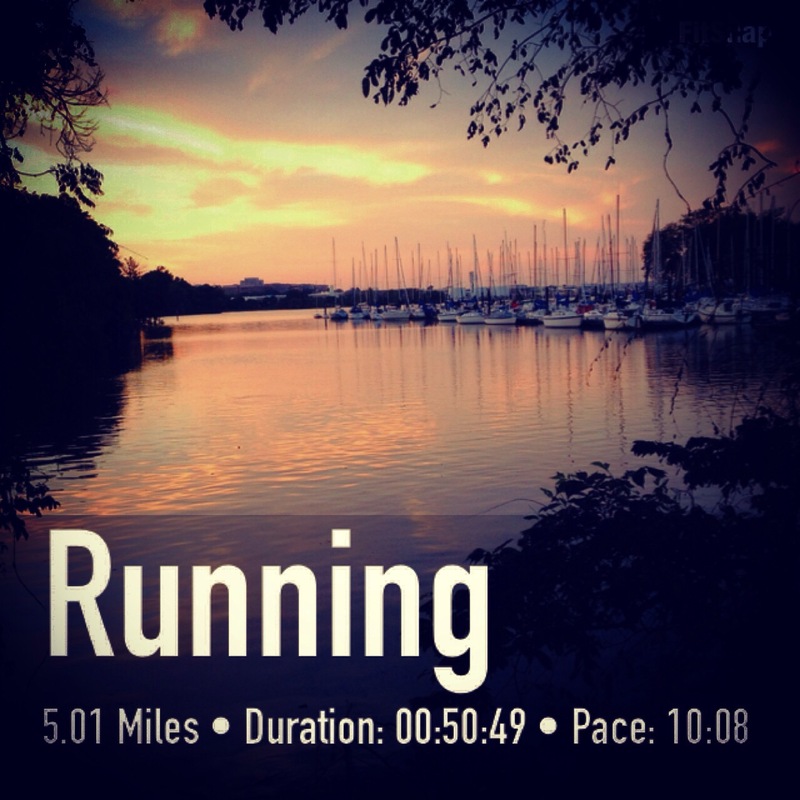 On Monday, I ran 5 miles along one of the marinas in Alexandria at sunset. My injured leg started hurting but I pushed through and the pain seemed to subside towards the end of the run, and with scores of gnats swarming the trails, I had plenty to keep my mind off my leg. Tuesday, I took the day off. That was in my plan anyway, but I was extraordinarily tired for some reason. Even swimming laps in the pool was exhausting. I walked about 2 miles to and from the mall, looking for a present for my sister who turns 21 soon, and I met with a couple of friends at the pool where I just enjoyed the playful feeling of swimming underwater like I used to when I was a kid. No structured laps, just playing. Wednesday, I had a physical therapy appointment. Things seem to be on track and I had expressed optimism to the doctor that I was seeing some improvements. However, the needle point release treatment he is giving me, which involves sticking needles in my hip and making the muscles twitch, left my hip feeling really sore and achy. I was in pain most of the day and decided not to run my planned 7-miler that evening. I have faith in the treatment, but for some reason, this one hurt more than it did last time. Thursday, I had made plans with a friend to catch up over dinner. I didn’t wake up early that morning, nor did I want to. I am not a morning person. I sometimes think I should stop trying because it just makes me feel worse about myself as a runner when I can’t get out of bed and go. On the downside, when I don’t make it happen, all the running mantras plague me– “If you want it you’ll make it work. If you don’t, you’ll make excuses.” Nothing feels worse than having a bunch of tattle-tales in your head making you feel guilty about taking another rest day or not waking up early. It’s safe to say I am at war with myself. Friday, however, I got out for one of the most glorious runs I’d had in probably over a year. I started out with a 10:21 pace for mile one and the pace times just kept ticking downward from there. It was as if my legs were running for me, free and fast and as if nothing of the past year of hard, painful runs finally had loosened its grip on my legs. I didn’t just run– I was flying. The paces kept getting lower, there was no pain in my legs. My mind was right where it needed to be. My last split was an 8:56. An under-9:00 pace on the last mile of my run! To say I was overjoyed was an understatement: I was so happy I cried. My average pace was 9:37. I hadn’t seen a number like that in so long. And I felt like I could have kept running if it wasn’t getting dark outside. A run like that said to me that I really could do anything I set my mind to, including Chicago. I felt like everything was going to be okay. Saturday, I took a rest day to enjoy a day at my favorite beach, Bethany Beach in Delaware. I woke up at 4:30AM and left at 5:45AM to drive the 3 hours to the coast. I’d packed a PBJ, some cookies, a banana, a couple of Sam Adams Summer Ales, and coconut almonds for my day. I stopped at a Walmart along the way to buy a beach chair on clearance. I brought a pillow to rest my head on so I could watch the waves and all the kids and families playing in them. I had sunscreen, a sandwich baggie for beach-combing, and a book to read. I know how to do solo “me-cations” right. Fried clam strips and malt vinegar fries! Cinnamon roll and coffee on the beach! I got to the beach around 9AM and already the shore was getting crowded. I found a spot close to the boardwalk and adjacent to the umbrella-beach chair rental stand so I could find my stuff if I decided to get up for a bit. After paying for parking, I got an iced coffee and a cinnamon roll topped with sugary, creamy frosting and sat in my chair watching the gulls dive bomb for crab and fish in the silvery morning. It was a little cool and somewhat cloudy to start, but almost right as the beach started getting more crowded, the sun came out and it became a perfect beach day. The water was warm, but I didn’t venture in very far since I was wearing the kind of swimsuit that does better on land. The sun was hot but I never felt like I was burning. I popped in my earbuds and listened to the playlist I made for the beach, called “My Happy Place.” Over the years, I’ve added to this playlist any music that reminds me of summers riding bikes as a kid, laying out with Sun-In and No-Ad tanning oil in high school, trips to the lake with college friends that end with drinking too much beer that night after the sun goes down, and every beach vacation in between. My playlist includes pretty much every hit from Kenny Chesney’s “When the Sun Goes Down” and “Be As You Are” album mixed with Bob Marley, the Beach Boys, and oldies like “Under the Boardwalk” by The Drifters and “In the Summertime” by Mungo Jerry, but what makes it unique to me is the number of “random” songs I’ve added over the years, like “Ocean Avenue” by Yellowcard, “You Got the Style” by Athlete, “Lights Out” by Santigold, and “Dance Like This” by Wyclef Jean. This year, I added “Sleeping With a Friend” by Neon Trees— the intro started playing as I was leaving and the sunset was casting a golden glow on the town. Seemed very summer-y to me. I had a wonderful day at the beach and made it as much of a mini-vacation as I could. I wore a fun sundress to do some shopping around the boardwalk where I bought myself some fun souvenirs and a pair of bumblebee earrings from a local jewelry store. I ate fried clam strips and malt vinegar fries for dinner on the sand. I got white chocolate mousse fro-yo for dessert. It was a pretty perfect day. Running with a storm like this is not smart! My head was not in a good place. I’d gotten some news that, as much as I tried, I couldn’t turn around and think positively about. It ruined my day. Ever have a run where your iPod shuffles all the wrong songs? I tried restarting my shuffle about 6 times and all my songs were awful. Like, slow songs and even a Christmas song and a couple of songs that fed my negative mood. My Yurbuds broke. The microphone somehow thinks I want to turn Siri on, but it turns on and off without me pressing a button in an almost blinking on-off-on-off pattern. It makes my Nike training app says “Pausing workout, resuming workout” almost without catching a breath over and over and over. The volume switch makes my music blare at the highest volume, so loud that I have to yank my earphones out of my ears or go deaf but even pausing the music so I can lower the volume before playing it again turns Siri on. Plus, somehow pressing the microphone makes the songs speed up to warp speed. I know this blog is not endorsed by any product, but consider this my official review: While Yurbuds do stay in your ears, for the price they come at, don’t waste your money. I’ve only had mine since April, and I have been traumatized by my pair as of late. My first split was 11:21, my second split was 9:37. I was running too fast for a slow-paced long run and almost immediately burned out. The wind was strong as hell. I’ve run some windy runs before, but this was almost impossible. I went from a 9:37 split to a 12:25 split in the next mile. That is too much variation. Despite having hydrated ALL DAY with about 60 ounces of water, I was dry as paper and thirsty as hell. That doesn’t even make sense. But when you’re chugging from a water fountain at mile 1.5 of a 10-miler, you’re already screwed. There’s a spot I have to run through where all the tourists like to sit and watch airplanes take off and land at DCA. It used to be a place only the locals knew about, but somehow, the secret got out and now the place is always crowded. They stand in groups on the path and in the grass and they don’t move when you run through. With the storm coming through and the cool clouds posing some awesome photo opps, getting through was nearly impossible. Even after calling to families not paying attention to please stay off the path and that I’m coming through, I still managed to knock a family off the trail. I yelled over my shoulder, “I told you that I was coming through, don’t stand on the path where people are trying to get by!” Everyone was staring at me like I was the jerk– how dare I run on the place designated for those who are passing through when there’s about 6 acres of park for everyone else to stand on— so this incident only made my mood even worse. To make matters worse, a runner-tourist kept stopping on the path almost right in front of me to snap pictures and then she would start running almost as I was about to catch her. Seriously….move off the damn trail if you’re going to stop. I just can’t even fathom the lack of awareness people have when they visit DC. I took a bottle of water that I had dropped a Nuun tablet into for hydration along my run. And it was like running with an explosive. The bottle shook as I ran which made the bicarbonate in the water fizzle and that meant it had to go somewhere because there was no room in my tightly-closed bottle, so it leaked stickiness all over my hands and shot like a fountain when I tried to pop the top just to relieve the pressure. Plus, I think Nuun makes me sick. I sipped some in my second mile and felt sick in my third mile. I do not endorse Nuun. It is sticky, messy, and makes me sick to my stomach. I stop to sit down on a park bench to try– TRY– to get my head right. I see a creepy-looking guy approaching me. He’s watching me. I start praying, “Please don’t hit on me, please don’t hit on me.” He does. He calls me baby. Now I feel gross. About 20 feet up the trail, he turns around in the middle of the path to walk past me once again, leering at my legs and, well, everything else. There’s no coming back from that, and men will never understand how dirty it makes you feel to be leered at in that way. I got up and ran away as fast as I could. It’s quiet on the Virginia side of the Lincoln Memorial. 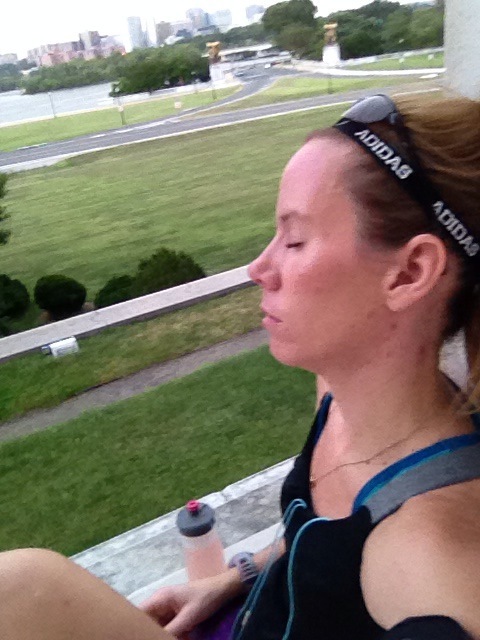 Instead of turning around and running home, I ran to the Lincoln Memorial in a last-ditch effort to find the one spark of motivation to finish what I had started by running steps, like seeing the immensity of the monument and remembering that I had nothing to be downtrodden about would turn this thing around for me. It wasn’t there. I considered running and up down the steps– just for the sake of doing something. But the rain started pouring which made the marble steps dangerously slick, and the monument was crowded with Labor Day tourists, plus I was dying of thirst and feeling irretrievably defeated. What the hell was that!?! How could so much go wrong in 3 miles, how could I have become so downtrodden and bothered, how could I have tried so hard to be positive by not letting a bad mood ruin my run and yet I couldn’t rise above it? Anyone who says a mind-body connection doesn’t exist in running has no idea what they’re talking about. I walked 8 blocks to the Foggy-Bottom Metro in pouring rain, feeling like a total fool and sensing my trepidation about the Chicago Marathon coming back to me. I wanted to run on the treadmill at the gym, but I decided to just let it go, cut my losses, and try again tomorrow. Monday came, and it was Labor Day: the last unofficial day of summer. Usually, welcoming fall isn’t that hard for me to do— I love pumpkin beer, warm days and crisp nights, and burning apple cinnamon candles as much as the next person– but this year has been really hard for me to let go of summer, probably because it was the first summer in which I had regular access to a pool. 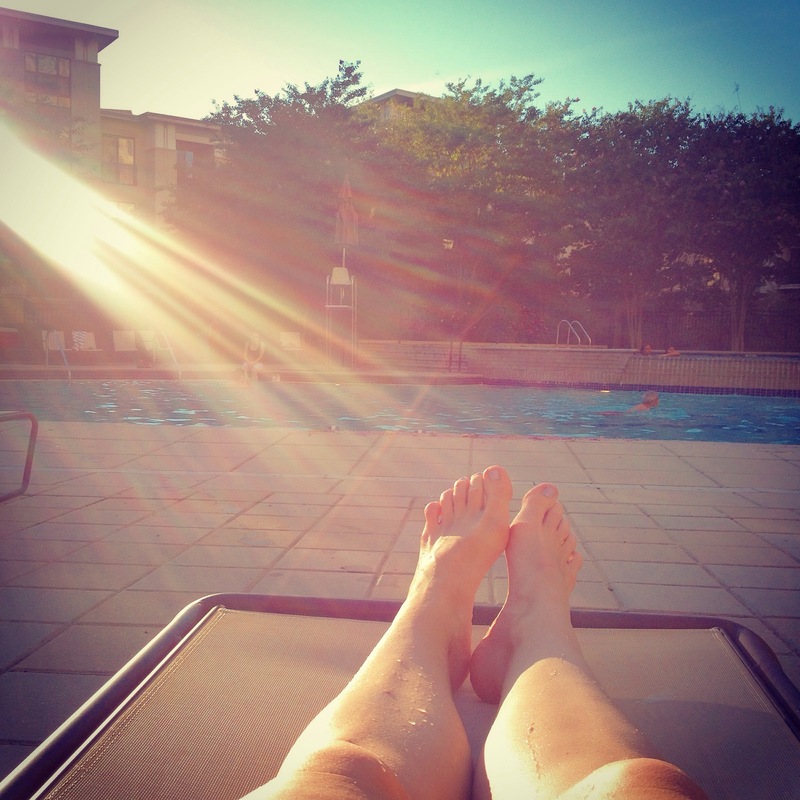 My apartment overlooks the pool, and I usually leave my windows open all day instead of turning on the AC, so I heard a lot of the joyful sounds of summer being had at the pool. I decided I would run my 10-miler that evening and spend time at the pool on the last day it was open for the season. Unfortunately, everyone else had the same idea and it was hours before a lounge chair opened up. Around 4PM, I decided to go for my run so I could get back in time to enjoy the pool in the evening when a chair would likely be open. As luck would have it, for the second day in a row, DC got a huge thunderstorm at 4PM. If I had been out there running, I probably would have been blown away. Literally. The wind came up so hard and fast that I had to slam my windows shut and mop up some rainwater that had blown into my apartment. It was an intense storm. It was also pretty quick and gone within 30 minutes. Having stared at the pool all afternoon waiting to spot an empty lounge chair, the pool post-storm was empty under a cloudless sapphire sky. I was torn. If it wasn’t the last day the pool was open, I’d have just gone running, but I wanted to enjoy one last swim before it officially closed. There would be about 9 months of staring at an empty pool deck, so I had to take one last swim to keep me warm for those long months ahead. The water felt amazing, and it was flecked with little pink flowers and leaves from the earlier storm. I almost didn’t mind– it felt like swimming in some enchanted pool. I started out by swimming 300 yards and decided I wanted to water-jog. This was a daring move for me– water-running has a weird stigma to it, and on the other end of the pool was a group of kids probably in their post-college, entry-level job stage. I felt weird, like I was back in junior high gym class about to be teased for my dorky gym clothes, but I had a workout to complete so I charged ahead in all my nerdy, uncoolness. It wasn’t long before I realized that I might have actually started a trend. Two of the guys in the “cool kids” group decided it would be fun to race each other, and then out of nowhere, it was a battle between me and them and I couldn’t tell if they were making fun of me or what was going on there. They ended up beating me across, but I had about 1800 yards left to run– I’d have loved to see them challenge me to that distance. I don’t know how long it took me to run 1.25 miles in the water, but my legs were burning the entire time, and before I knew it, I saw five other people water-running before I got out. It wasn’t running 10 miles, but at the end of the day, I would have been sad to miss out on one final day at the pool when I will have the chance to run every day for the next 9 months before it opens again. All in all, at this point, the Chicago Marathon is still a huge question mark for me. My last long run was now five weeks ago. The longest I have run since was 6 miles. While I have been as diligent as I can with keeping my base intact between moving and starting a new job and an injury, I don’t know if it will be enough. Willpower is a very powerful tool to have in your box, and I have it. But the impacts of running a marathon on an untrained body are real, too. I feel that I can be ready in five weeks if my goal is to just finish the race, but I’m waiting to find out what the cost will be. I know I can’t have the race finish I dreamed about– that will have to come another day. But will I feel guilty for finishing a race that I didn’t really train for, regardless of the circumstances? Finishing a marathon is about more than a medal on your wall. The journey is in the training. It’s in all of the hours you put into it, all the sacrifices you made, all the moments when you get so frustrated you want to quit but you try again because something deep down tells you, “You are not done yet, so get your freakout out of your system and try one more time.” I wanted this race to be about all of that. And instead it’s been about overcoming injuries and squeezing in a distance run in between good-bye parties and lifting heavy boxes and shaking hands with new co-workers. All of those things were more important than this race and Chicago had to take a backseat to it all. That’s not how I started out. Then again, as marathoners, we all know that the race we set out to run is almost always never the race we actually do run. The question now is, do I try anyways? I almost didn’t run the Run for the Ranch Marathon when I went to bed at 8PM and realized I had to be up by 2AM– not 4AM– to get to the race on time. And I ran my second fastest marathon ever that day. What if I were to give up Chicago when I could have finished with a respectable time, even despite my rough training? And who’s to say there is no glory in trying? Can I let myself not try? Conversely, if I don’t go, I could potentially heal in time to run 3 great half-marathons and possibly beat my 1:57 PR and become a Half-Marathon Fanatic. There could still be some good to come out of this and now I have all the ingredients for a great fall race season. The choice really is up to me, but I don’t know how to make it. Thank you 🙂 Keep reading!